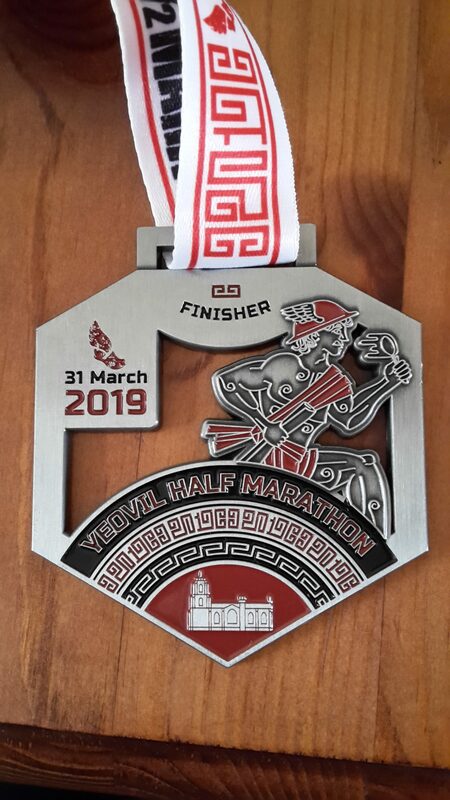 My strategy for this race was to enjoy it, get the miles in my legs, practice the mental side if it got tough and practice my fueling for the London Marathon. I just really wanted to completely enjoy this race, put the demons from The Grizzly to bed and to give me a good physical and mental feeling for the marathon. 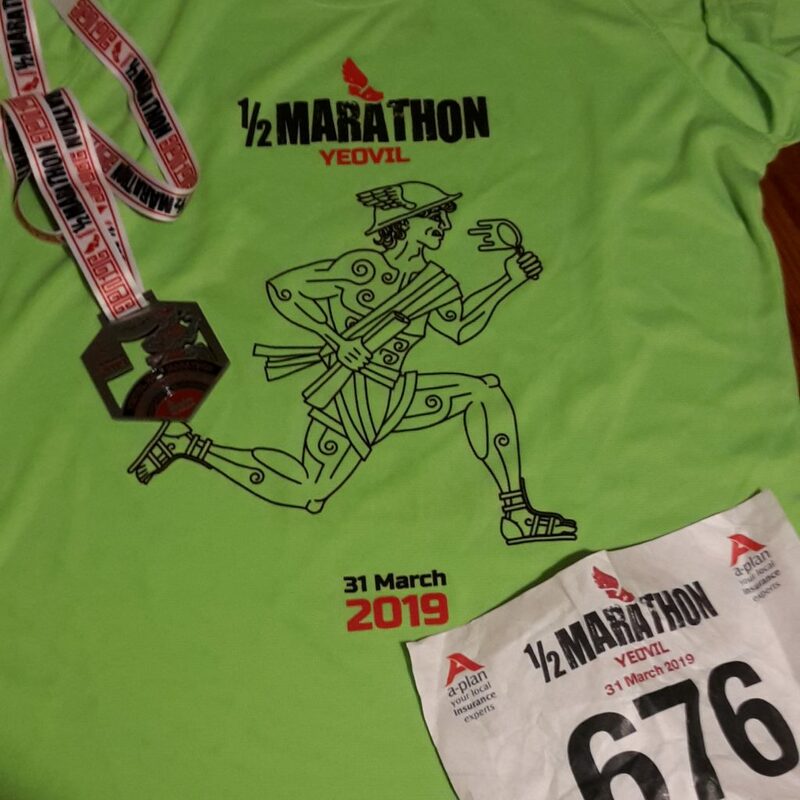 I travelled to Yeovil with three other runners from the club which was fun and made the pre-nerves more bearable plus we all had coffee and cake afterwards which ended the morning in the right way. We arrived with plenty of time to Que for the loo, chat to our fellow club runners and drop our bags off. I wore my club vest and because I didn’t want to wear two layers as I knew I would get too hot, I wore my arm sleeves for the first time, I was also trailing my Spi belt for the first time to carry my inhaler in and both were excellent. The 9 am race start did mean a 6.15 am alarm call but least it means that your race is over before lunchtime and you are home not to long after that. Just before 9 am we got on to the start and I tried to find GPS on my watch with no luck, so I ran on indoor GPS, just meant I have no pace data to look back on and it probably helped me to run at an enjoyable pace as I knew the pace per mile would be out. I took the start of the race at a nice easy pace, I was behind the 2-hour pacer for the first 3 miles and this was good training for the marathon to make sure I don’t go out too fast. I settled in to a nice easy pace and tried to relax, enjoy the race and to take in the route. Before the 5-mile mark I got chatting to a fellow runner, he had run London Marathon last year and we ran together until the first hill when he stopped and walked. I felt good really good running the hill section, I just slowed my pace down, focused on my feet and I over took a lot of runners, the slow start I had at the beginning of the race probably gave me the energy to feel strong up the hills. At the top of the final hill about 9 and a half miles I felt good, so I started to pick up the pace, but I still didn’t look at my watch, I just went on how I felt. On the penultimate hill a female runner said to me I am using you to get myself up this hill and I said that is fine, however on the downhill I kicked on and she couldn’t stay with me. The last hill was the worse of all the hills because it was short, steep, you had just enjoyed the long downhill section and your legs were beginning to tire. In the last mile my legs were starting to get heavy, but I tried to maintain my speed and mentally tick off the meters left to run, which became easier to do when you see runners that had finished running towards you. You turn a corner to find the finishing straight through the shopping mall and I kicked in to a sprint finish, with cheers from my running club and I overtook a few runners as well. I finished in 1.56.57 and 717/1624 runners and was given a fantastic bright green t shirt and a good looking medal. The circular route starts and finishes in Yeovil town centre, the start is outside the town hall and it heads out along Yeovil Country Park before heading out of town alongside the industrial estate. It went through a new housing estate before you hit the quite country lanes leading to Montacute House via the outskirts of the airfield. It was lovely to run through part of the estate at Montacute with many supporters lining the route, there was a short gentle climb to exit the estate to re-join the country lanes. At around mile 8 to mile 9.5 there was a collection of hills which I wasn’t expecting and neither did the runners around me, they were not massive (like the humdinger hill) but still a lot on a road half marathon. The first one was easier than the second, probably as we didn’t expect to have the second hill to conquer. Once at the top it was flat well flat apart from two very small but sharp inclines, one at just before 10.5 miles which led into a long down hill run to bring you back in to the town and the second hill was towards the end of the 12th mile. The finishing stretch went through the shopping area so there were lots of supporters and runners that had finished cheering you on and the last 500 or so meters were downhill to bring you the finish line. In between the hill and the last 500 meters you were sent on a pedestrian underpass which was tiny but included an extremely short say 3 metre very steep windy incline to bring you out of the pass. The finishing 100 m was in a narrow shopping area, so it felt really intense due to hundreds of supporters and runners as you sprinted to the line. 13.1 miles and 700 ft/213.36 meters of elevation gain. At the finish you were given your bight green technical t shirt and your medal, with the results online you can print off a certificate and watch your finish. Great organisation on the day, lots of porta loos outside the town hall where the start is, there is was also tea and coffee available here pre-run and the hall was the bag storage too. The only slight issue that the hall is not big enough and so it can only accommodate a handful of runners, not good if it was a wet day. The free parking is a great bonus as it means that most runners would go in to the centre of town for a coffee. There were plenty of water stations along the course, I feel like station number 1 should be moved down the path as it was really congested with supporters which meant the path you were running along was made even narrower, with it being only a couple of miles in, it hadn’t given time for the runners to spread out and the drinks station was only on one side. You were running along and suddenly you were upon it as you couldn’t see the sign due to all the supporters and you then had runners crossing in front of each other. The water station that was positioned in the grounds of Montacute house I feel should be moved or there should be another water station at the top of the last hill of the hilly section around mile 9 as I needed a drink after running the hill section. Social media was not used that much, just to post in the days leading up to the race and to let you know that the results were out and where to find the photographs. You were emailed the race day information plus the booklet came with your race number. Yes, I would as it is a great route, you have the town and the countryside, it is flat/undulating with most the hills in the mile or so between 8 and 9.5 miles. 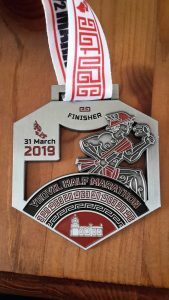 There were a lot of supporters on route which was nice and plus you get a technical t shirt and a fabulous medal all for the reasonable price. Just read about next years race and they will be no longer giving race t shirts to help reduce plastic waste (as polyester is made from plastics) but free professional race photographs instead. Cost £27 affiliated and £29 non-affiliated for 2020 race.